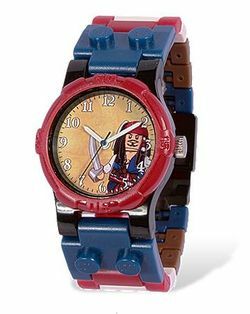 5000141 Jack Sparrow Watch is a Pirates of the Caribbean LEGO Time watch released in 2011. This is a description taken from LEGO.com. Please do not modify it. (visit this item's product page) It’s time to set sail for a building adventure! Build your own LEGO® brand Pirates of the Caribbean™ watch! Start with the illustrated face, then add black, brown, red, blue and white links to build the watchband in any pattern you like. Includes an illustrated image of Captain Jack Sparrow on the face. Add the studded bezel and click into your personalized LEGO brand Pirates of the Caribbean gear! Build the watch, then build the minifigure! Makes a great gift for LEGO brand Pirates of the Caribbean fans! LEGO ClicTime watches are tested to ISO standard 2281 to a static depth of 50m. * This means that our watches are splashproof. Facts about "5000141 Jack Sparrow Watch"
It’s time to set sail for a building adventure! This page was last edited on 9 January 2016, at 18:42.